Sairat remake Dhadak fails to match the original chartbuster. 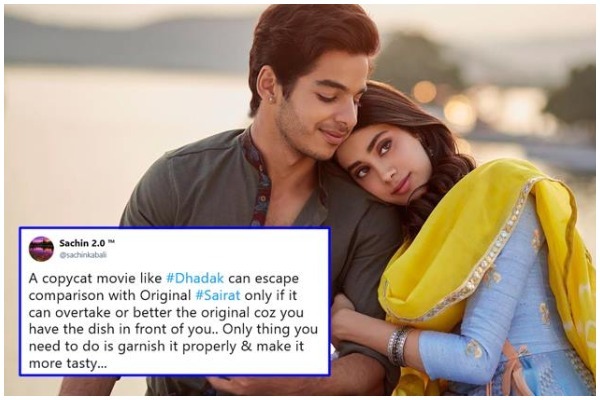 B-town celebs are all praises, but twitterati is not pleased with Janhvi Kapoor-Ishaan Khatter starrer Dhadak. The much awaited and talked about film ‘Dhadak’ has finally released. Karan Johar produced and Shashank Khaitan directed movie has introduced two starchildren to Bollywood—Janhvi Kapoor and Ishaan Khatter. Now, the pressure of belonging to influential filmy families plus helming the remake of a National Award winner movie is not easy. We are sure Janhvi and Ishaan can vouch for that! Previously in an interview Janhvi confessed that she feels bullied because of the family she belongs to and wishes that fans would give her a chance. While Bollywood is praising the critically acclaimed Marathi film Sairat’sHindi remake, twitterati have had a mixed experience. As per celebrities, both, Ishaan and Janhvi have entered Bollywood with a bang. ENJOYED #Dhadak ! !#JanhviKapoor is so immensely watchable! She surprised me with her ENDEARING performance! @imIshaanKhatter is a completely ENERGETIC actor! @AjayAtulOnline ‘s title track is on LOOP! However, the twitterrati have a different tale to tell. Many have called the film a cheap knock off of the Marathi masterpiece ‘Sairat’. Some have even accused ‘Dhadak’ for using the tested poor versus rich angle in the ‘Romeo and Juliet’ fashion. Whereas mostly fans of the Marathi film are disappointed that the central conflict of ‘Sairat’ was not present in ‘Dhadak’. But some have praised the film and congratulated the actors on their stellar acting. Guys plz avoid watching #Dhadak in theater. It's a wast of time and money. Flagship bearer of nepotism @karanjohar should be taught a lesson that you cannot ruin a masterpiece just to launch some star kids.! See sairat and you will be wowed by everything in the movie. See dhadak and you will realise what a waste of money! Clearly, ‘Sairat’ remake ‘Dhadak’ has garnered mixed reviews from the audiences. Now let us crunch numbers. As per trade analyst Taran Adarsh, Dhadak has released in 2,235 screens in India and 556 screens overseas, including Pakistan. Reportedly, ‘Dhadak’ has received nearly full occupancy with 90% pan India. The movie opened the strongest in the states of Gujarat, Uttar Pradesh and Bihar. According to several trade analysts ‘Dhadak’ is expected to do well in its first weekend as no major Hindi or English movies pose any threat to the remake. ‘Dhadak’ is expected to mint over Rs 25 crore on the box office during this weekend. However, as per trade expert Akshaye Rathi the movie’s box office collection may suffer when Marvel’s ‘Ant-Man and the Wasp’ hits the theatres and if the rain continues to persists.